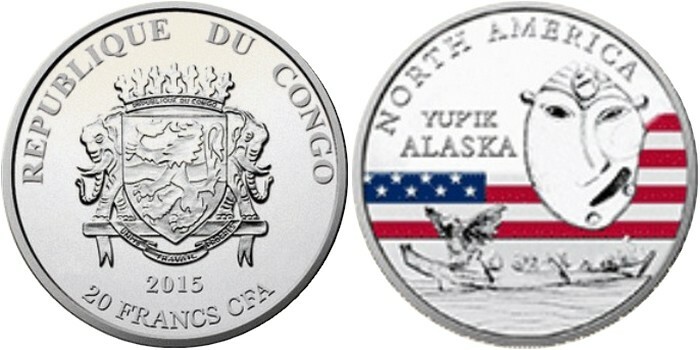 REPUBLIQUE DEMOCRATIQUE DU CONGO 4 x 240 Francs 2016 – Année du Singe – 4 x 31,1 g Argent 999 Proof – 5000 exemplaires – diamètre 40 mm – prix ignoré. 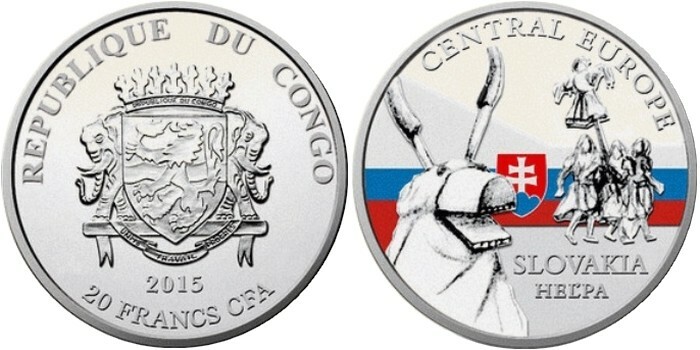 CONGO DEMOCRATIC REPUBLIC 4 x 240 Francs 2016 – Year of the Monkey – 4 x 31.1 g 0.999 silver Proof – mintage 5,000 – diameter 40 mm – unknown price. 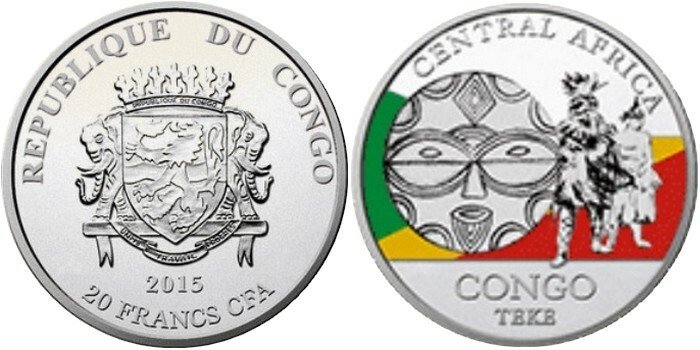 CONGO 5 x 20 Francs CFA 2015 – Masques rituels des régions du monde – 5 x 31,1 g Argent 999 Proof – 800 exemplaires seulement – diamètre 40 mm – prix 53 euros chaque. 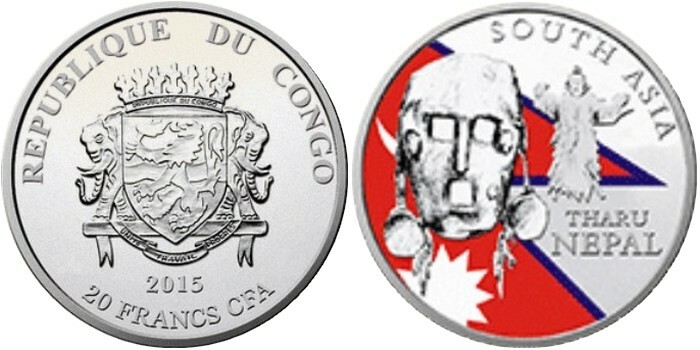 CONGO 5 x 20 Francs CFA 2015 – Ritual Masks of the World Regions – 5 x 31.1 g 0.999 silver Proof – mintage 800 pcs only – diameter 40 mm – price $60 each. 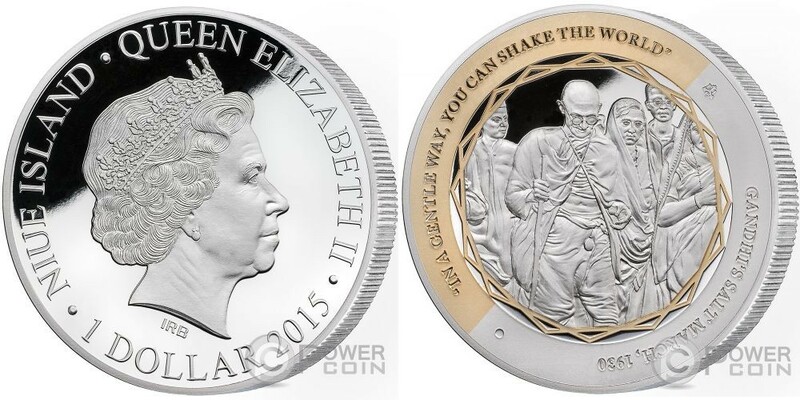 NIUE 5 x 1 Dollar 2015 – Gandhi – 5 x 31,1 g Argent 999 Proof – 10 000 exemplaires – diamètre 38,61 mm – prix du set environ 500 euros. Images Power Coin. 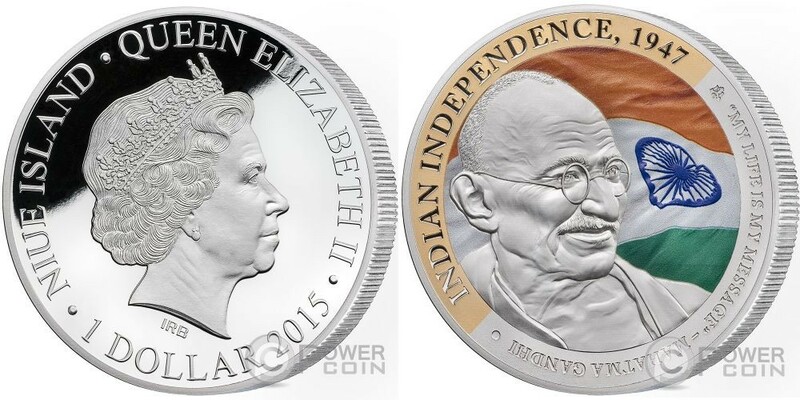 NIUE 5 x 1 Dollar 2015 – Gandhi – 5 x 31.1 g 0.999 silver Proof – mintage 10,000 – diameter 38.61 mm – approx. set price $570. Pictures Power Coin. NIUE 25 Dollars 2015 – Léonard de Vinci – Chefs-d’oeuvres d’un genie – 202,15 g Argent 999 finition antique – 500 exemplaires seulement – diamètre 100 mm – prix environ 550 euros. Images Power Coin. NIUE 25 Dollars 2015 – Leonardo Da Vinci – Masterpieces of a Genius – 6.5 oz 0.999 silver antique finish – mintage 500 pcs only – diameter 100 mm – approx. 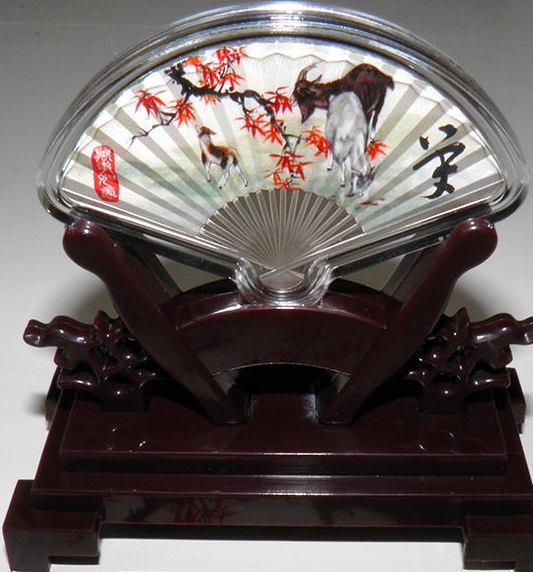 price $625. NIUE 2 Dollars 2016 – Disney Tiana – 31,1 g Argent 999 Proof – 10 000 exemplaires – diamètre 40 mm – prix 70 euros. 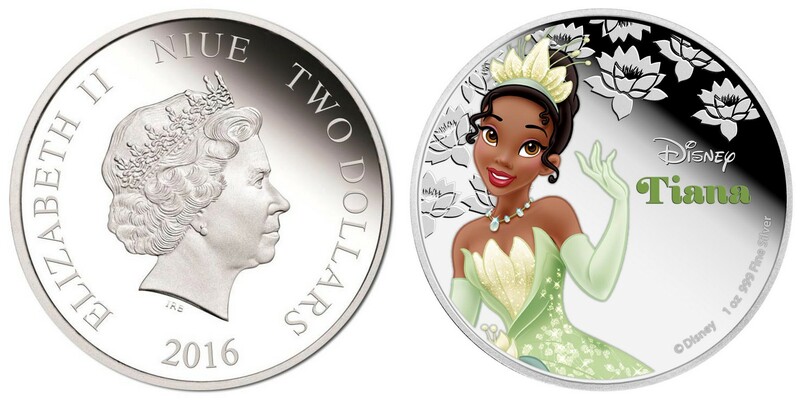 NIUE 2 Dollars 2016 – Disney Tiana – 1 oz 0.999 silver Proof – mintage 10,000 – diameter 40 mm – price $80. REPUBLIQUE TCHEQUE 200 Korun 2015 – Josef Bozek – 13 g Argent 925 Proof – 10 600 exemplaires – diamètre 31 mm – prix 20 euros. 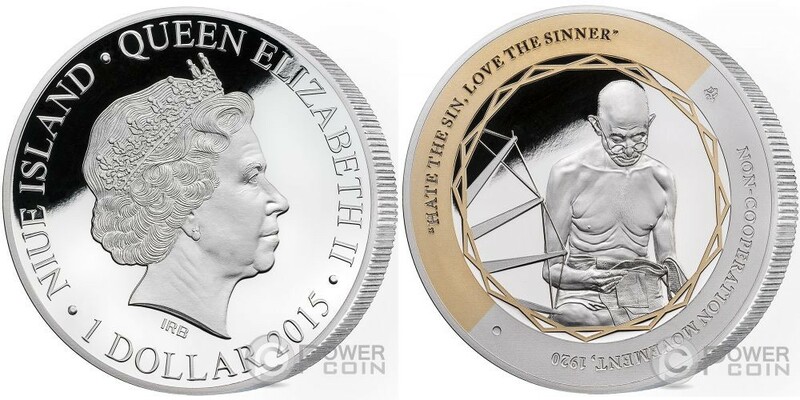 CZECH REPUBLIC 200 Korun 2015 – Jozef Bozek- 13 g 0.925 silver Proof – mintage 10,600 – diameter 31 mm – price $23. REPUBLIQUE TCHEQUE 500 Korun 2015 – Vaclav Tham – 25 g Argent 925 Proof – 9400 exemplaires – diamètre 40 mm – prix 35 euros. 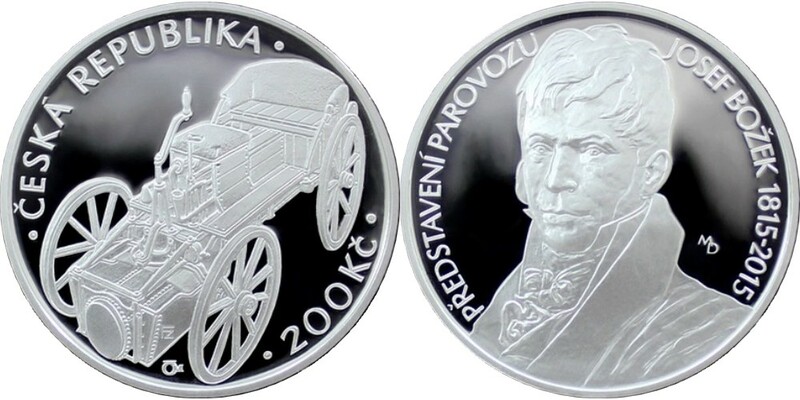 CZECH REPUBLIC 500 Korun 2015 – Vaclav Tham – 25 g 0.925 silver Proof – mintage 9,400 – diameter 40 mm – price $39. 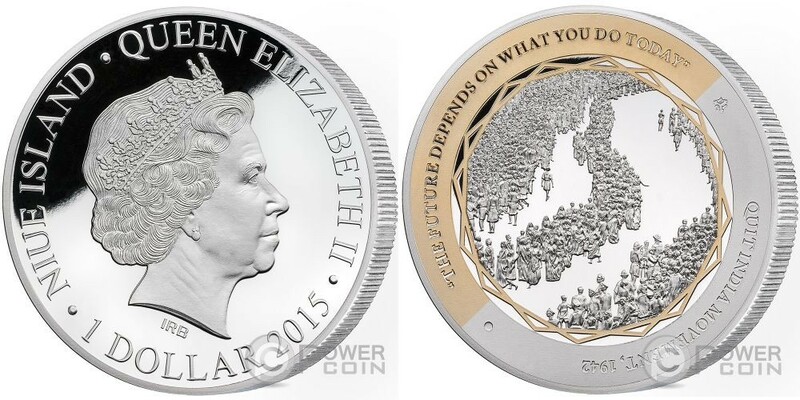 NIUE 2 Dollars 2015 – Karol Dobias – 29 g Argent 999 Proof – 500 exemplaires seulement – diamètre 40 mm – prix 54 euros. 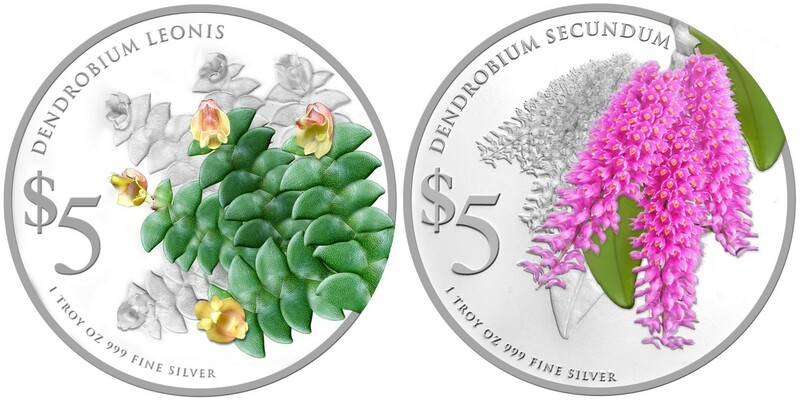 NIUE 2 Dollars 2015 – Karol Dobias – 29 g 0.999 silver Proof – mintage 500 pcs only – diameter 40 mm – price $61. NIUE 4 x 1 Dollar 2015 – Emblèmes des escadrons de l’aviation tchécoslovaques – 4 x 16 g Argent 999 Proof – 500 sets – diamètre 34 mm – prix du set 164 euros. NIUE 4 x 1 Dollar 2015 – Czechoslovak airmen in RAF Squadron badges – 4 x 16 g 0.999 silver Proof – mintage 500 sets – diameter 34 mm – set price $185. 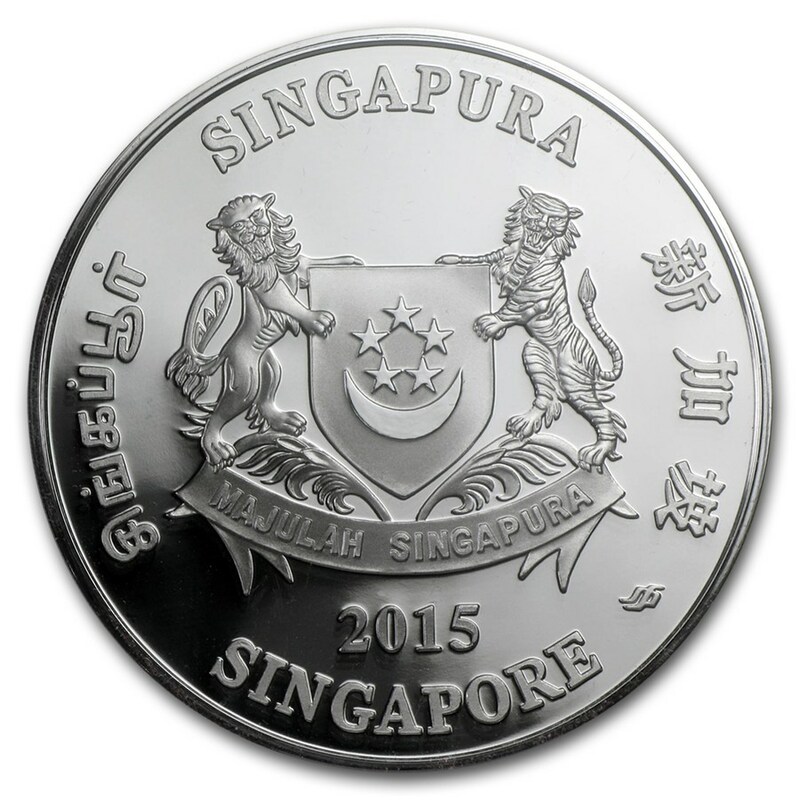 SINGAPOUR 2 x 5 Dollars 2015 – Fleurs de Singapour – 2 x 31, g Argent 999 Proof – 10 000 exemplaires (+ 3000 en sets de deux pièces) – diamètre 40,7 mm – prix 83 euros chaque. SINGAPORE 2 x 5 Dollars 2015 – Flowers of Singapore – 2 x 1 oz 0.999 silver Proof – mintage 10,000 (+ 3,000 with 2 coins sets) – diameter 40.7 mm – price $92 each. UKRAINE 2 Hryvnia 2015 – Zodiaque Scorpion – 7,78 g Argent 925 spécial UNC – 10 000 exemplaires – diamètre 26,5 mm – prix environ 15 euros. 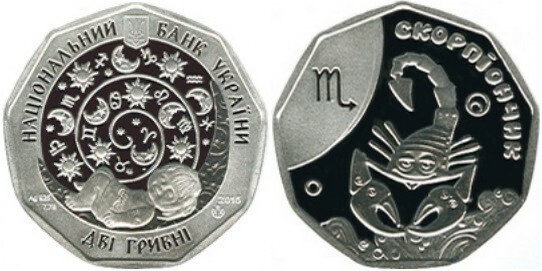 UKRAINE 2 Hryvnia 2015 – Zodiac Scorpio – 7.78 g 0.925 silver special UNC – mintage 10,000 – diameter 26.5 mm – approx. price $17. LUXEMBOURG 5 Euro 2015 – Chat sauvage – 14,93 g Argent 925 + or nordique – 3000 exemplaires – diamètre 34 mm – prix 45 euros. 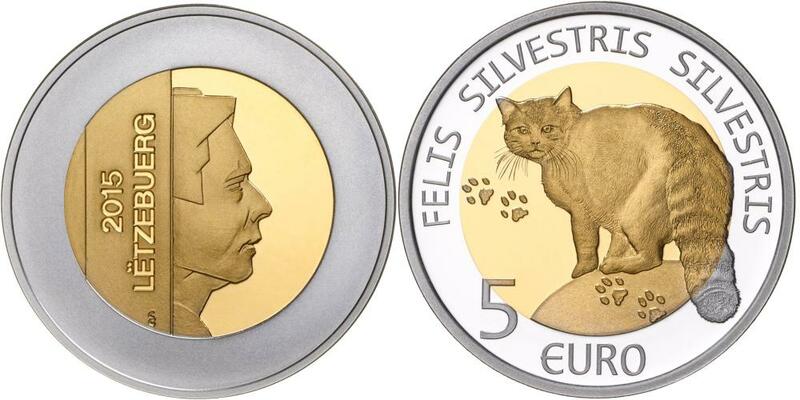 LUXEMBURG 5 Euro 2015 – Wild Cat – 14.93 g 0.925 silver + nordic gold – mintage 3,000 – diameter 34 mm – price $50. 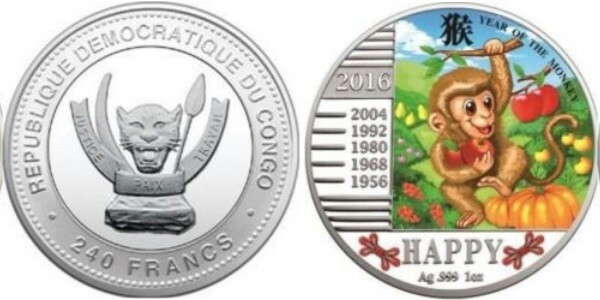 TANZANIE 1000 Shillings 2016 – Année du Singe – 31,1 g Argent 999 Proof – 8000 exemplaires – taille 55 x 34,3 mm – prix ignoré. TANZANIA 1000 Shillings 2016 – Year of the Monkey – 31.1 g 0.999 silver Proof – mintage 8,000 – size 55 x 34.3 mm – unknown price. 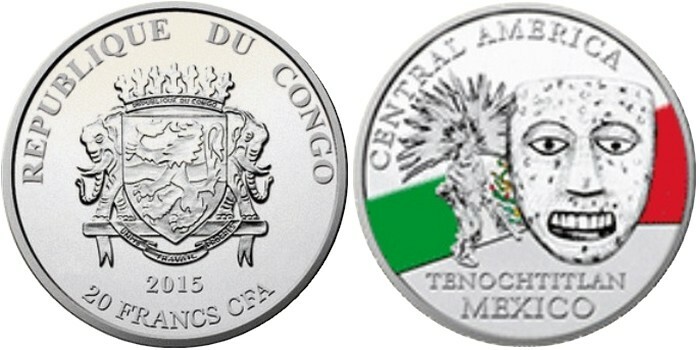 TANZANIE 1000 Shillings 2015 – Année de la Chèvre – 31.1 g Argent 999 Proof – 8000 exemplaires – taille 55 x 34,3 mm – prix ignoré. 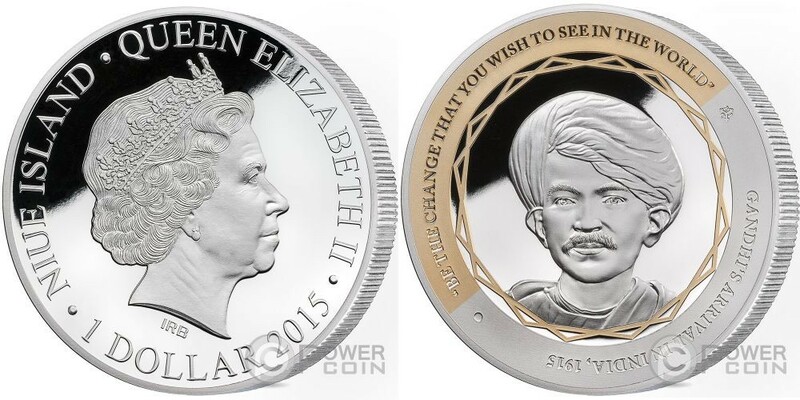 TANZANIA 1000 Shillings 2015 – Year of the Goat – 31.1 g 0.999 silver Proof – mintage 8,000 – size 55 x 34.3 mm – unknown price. 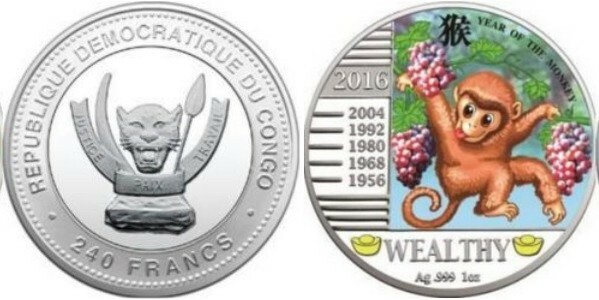 TANZANIE 1000 Shillings 2015 – Big 5 – Eléphant – 31.1 g Argent 999 Proof – 5000 exemplaires – diamètre 38,61 mm – prix ignoré. 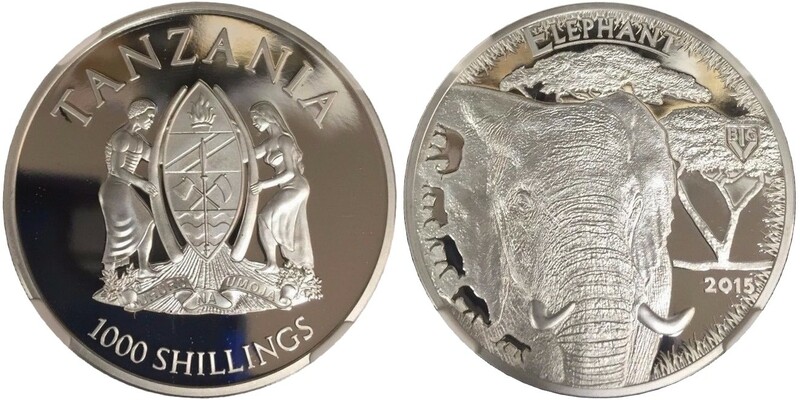 TANZANIA 1000 Shillings 2015 – Big 5 – Elephant – 31.1 g 0.999 silver Proof – mintage 5,000 – diameter 38.61 mm – unknown price. 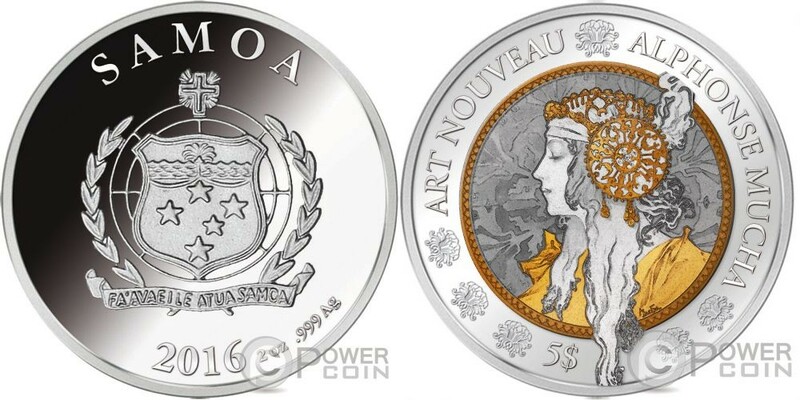 SAMOA 5 Dollars 2016 – Alphonse Mucha – 62,2 g Argent 999 Proof (plaqué or rose, or jaune et Ruthénium) – 2000 exemplaires – diamètre 50 mm – prix observé 299,95 euros. Images Power Coin. SAMOA 5 Dollars 2016 – Alphonse Mucha – 2 oz 0.999 silver Proof (rose gold, yellow gold and Ruthenium plated) – mintage 2,000 – diameter 50 mm – observed price $332. Pictures Power Coin.